Are you sure you are running Porteus? 001-core is independent of what DE you are using. In nemo I was putting /home/guest/.bachrc in the address bar and it wasn't finding it. It's not a folder, its a file!! I've been here 6 yrs, to the day actually, and I'm still learning new things. And actually it is not .bachrc either. Unlike with AppleOS or SM-Witless, you tend to learn stuff on Linux. Not just, as we call it in German, Clicky-Bunty, could be translated as Clicky-Colour'y, meaning it is only about the GUI, and never about a shell, a terminal or a virtual terminal. But often, this is where the real fun starts. You might have to first learn some stuff, but with scripts it is like so: It sure takes time to code one. But when you did code one successfully, quite some scripts do the menial repeating tasks for you, and it might have taken half a day, or maybe even two days to finally finish a certain script, but from now on, you just start it, probably with parameter or parameters, and the PC is doing what it was supposed to do from the very beginning: it is working on its own, and you just have to direct it towards what it should do. While Clicky-Colour'y, meaning you have to do every single small thing by yourself, doing every task by hand, and not having the PC doing stuff automated at all. Have you tried adding my psg function to your ~/.bashrc ? That way you would learn a bit more about why functions are such a neat concept, especially outside of scripts. The nice thing with functions, there are quite some stuff that won't work with an alias. But works as a function. I never could figure out why that was, but with my three commands dx, fx and sx (all displaying a date+time info including a separator line, then executing a variant of df, free and cat /proc/swaps respectively) fx is the only that works as an alias. dx and sx won't work as intended and had to be coded as functions. sx, the changed to MB info of cat /proc/swaps is more complex, but fx and dx seem quite similar on the surface, but with dx, it never worked as it should, displaying an outdated date+time info line, and I could never figure out why that was. The only solution I was able to come up with is changing dx from an alias to a function and then it worked as intended. Some of the questions about certain coding issues I did ask on here ( https://forum.porteus.org ) , and some have been unanswered ever since. But that's life. Most of the times I got good helpful replies. 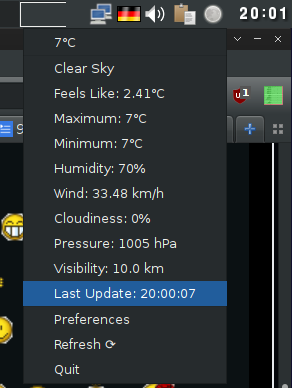 Any one has an idea how I can change that in simple-weather-indicator? "Last update: 04:03:16 pm" sounds so weird to me, and I dislike software that forces me to use a measurement I don't want to use. I prefer "Last update: 16:03:16". Of course I have no idea what it means. I would like to be able to control the frequency of update and have an icon appear in the panel. Basically we have 3 options; accept the app as it is, request it's creator change it, write our own. psg stands for ps grep. The only trick is that it omits the grep part itself, so, searching anything with "grep" in it will fail. I was just annoyed that I always got one hit more than I wanted, so I came up with omitting grep itself. That's what the "| /bin/grep -v grep" part is doing. Not every one is USA based, would you like it when every software forced °C, metre and military time on you? Instead of the ° you are used to, imperial measurements and am/pm. Oh, requesting is always good, at times it succeeds, at times it does not. But we should think positively, we don't know the person or persons who coded it, so maybe she or he would appreciate our input. And a bug report. But since I don't know for which DE the simple-weather-indicator-x86_64-20190206.xzm is meant to run, it is questionable if the application creator(s) would be interested in that bug report below at all. Since Openbox ( running on a dev version of a live Linux to boot) is not a DE, but a mere simple window manager. As you can see, for some weird reason, after I did click "update", and wanted to see what goes one via consulting top, there have been again two instances of /usr/bin/indicator-weather aka "-> ../lib/ubuntu-indicator-weather/indicator-weather" running. But maybe this is as it should be, maybe the "update" does indeed start a new version that just updates the data and then lets the already running in the tray version know that data got updated. I have no clue how the python script is doing stuff, for now I did not look into its code. So, I killed both instances as you can see below. Then I started it via ( progname & 2>&1 >/dev/null ) and that should do two things, make it independent of the terminal so that it keeps running even when the starting terminal got closed, and also suppress all warning or error or any other kind of messages via the "2>&1 >/dev/null" part. But it did not suppress the messages, and I have no clue why it did not do so. Any tips on why the suppression of messages did fail are greatly appreciated. As you can see, now, started anew, there is again only one instance running. And that one instance sure did update its data recently. But I cannot know if it was due to the kinda failed update or if its just asking for new data, since it was just started and all. I wonder if your network connect was in hibernate mode when the weather update tried to run causing it to hang. Next time, do your psg before clicking on the refresh option and then after. Also try killing just the 2nd task before the older one. Ya might want to edit this line. funny enough, I wanted to type "check" and it made "heck" out of it, making me look like I did swear. That is the downside by Dr. Copy & Mr. Paste, when you use the mouse buffer to do it instead of the system clipboard, it always inserts text at mouse position and not at cursor position. Unless you are using it in a text terminal, that is. That seems to be the line. And this https://docs.python.org/3.5/library/tim ... e.strftime is the needed info for tweaking the python code. Lets pull out the hacking gloves and get to work. < ## ## hacked into using 24 hrs time format by Rava@porteus, thanks to Ed_P@porteus for pointing the code line out to me. I could upload it if anyone's interested, or just apply the above diff yourself. Did you have to do anything special after changing line 250, like recycle the DE, reinstall simple weather or a submodule? No, I tested the python script file itself, prior creating my hacked_rava.xzm module. I just exited simple weather Indicator and restarted it via Menu/Utility/Simple Weather Indicator. And since it is a python script, it not needs anything more than that. Even now, officially the module by ncmprhnsbl is the loaded one. I just put my own hacked module into the /base/ but have to reboot to physically load it. But it makes no difference, both use the patched/hacked python code.